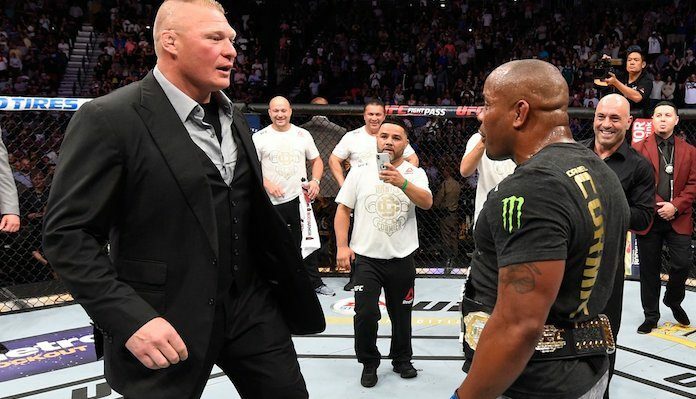 When Daniel Cormier captured the UFC heavyweight title with a July knockout of Stipe Miocic, the expectation was that he would battle former champ Brock Lesnar in a heavyweight title super fight sometime toward the end of the year. Unfortunately for Daniel Cormier, this fight still hasn’t happened, and from the sounds of it, he’s not sure it will. Speaking on The MMA Hour on Monday, Daniel Cormier updated on the status of this fight. “As of right now with the Lesnar thing, that’s kinda still up in the air,” Cormier said (transcript via MMA Fighting). “I’ve gotten a lot of, ‘You’re not willing to fight Jones, you talk trash about Jones [and he his drug testing issues], but you’re willing to fight Lesnar?’ Nobody knows what’s in place in terms of drug testing between Brock Lesnar and I. These are just general assumptions as to what is Brock Lesnar truly going through right now to try to be eligible to compete. We could be doing so many different things that people are unaware of, and if Brock Lesnar’s clean on the day that we fight, because of these things, then why can’t I fight him? Daniel Cormier has long planned to retire by the time he turns 40 in March, but with fights with Lesnar, Jones, and Miocic all hanging on the horizon, it sounds like he could be reconsidering those plans. We know that’s what Dana White wants. What do you think the next year holds for Daniel Cormier?